Internal market of the European Union in the context of the posting of employees, its future, individual sectors and the portfolio of the European Commission in the context of free movement of services were discussed during Citizens’ Dialogue with with Elżbieta Bieńkowska, Commissioner for the Internal Market, Industry, Entrepreneurship and SMEs. The beginning of the speech was an analysis of the current position of the EU Internal Market. It is believed that it is very strong and stable, while it turns out that none of the service markets of individual Member States is able to compete independently with external partners. According to the commissioner, the priority in this respect should be to consolidate and open a Single Market in a manner consistent with the original assumptions, and then, jointly, to conduct talks with external partners and competitors. Meanwhile, of the proposals currently being discussed in trilogues (the ending of which will coincide with the end of the term in the Commission), as regards the competence of the Commissioner, there is no single topic in which it is possible to form a coalition of states that are able to take into account common European interest, only in the second place the interests of individual countries and the protection of their own markets. The new role of Poland in the EU? The context of Brexit is not significant here. The United Kingdom was the largest supporter of the common market in the Union – with its exit from the EU, we are losing the only country with a completely free market approach, which supported the commissioner’s efforts to strengthen cooperation in the field of services. According to Elżbieta Bieńkowska, Poland has the potential to take the place of United Kingdom in the pursuit of closer cooperation between member states within the services market and to be included in a group of several countries with a decisive voice in the EU. „Poland has all the assets to be in this group of countries. In order to find a place in it, one must have negotiating, coalitioning, persuasive power, partners who are taken seriously. This is the only way to express the postulates of our part of Europe in a very strong voice and to be able to have even these countries behind us.” – explains the commissioner. „In our opinion, this proposal breaks treaties and conflicts with the common market.” – underlined Bieńkowska. Bieńkowska also pointed out that the example of a solution to facilitate the functioning of entrepreneurs was the so-called e-service card. On its basis, the entrepreneur could confirm that he is acting in accordance with the law and meets all the requirements necessary to provide services in another country. The proposal occured in both the Parliament and the Council. This raises the question, do we really want a common market and the free flow of services? Everything seems to indicate that, contrary to the assurances of the leaders, now the member states support only those proposals which correspond to their national interests. Therefore, especially in the pre-election period, one should ask what Europe should be. This is a much broader question than the mere question of the common market. The Commissioner emphasized that what is happening in the European institutions has a direct impact on our everyday lives, so it is worth considering how we want the European community to look like? This is the most important question for the Commission and the Parliament itself, but also for us – citizens. It is impossible to talk about the European services sector without considering what its shape will be like after Brexit. However, this is extremely difficult – Elżbieta Bieńkowska evaluates the preparation and the proposal of the Commission as very accurate. However, she pointed to indecision and inconsistency in the votes of United Kingdom – a decision in this respect is necessary in order to achieve a general agreement, without which further discussion on sectoral solutions is not possible. Where do protectionist tendencies in the EU come from? The first question from the audience of Dialogue was about where the prevailing in Europe prejudices against the posting of workers, presented in campaigns and public opinion as a phenomenon concerning professions related to physical work, abuse, “cheap labour force” and even exploitation, which is not true. Posting of workers covers the entire spectrum of sectors with different profiles (referred to, among others, at the plenary session on the first day of the ELMC) – artists, IT employees, designers etc. are delegated. According to the Commissioner, the source of problems is the fact that competition from employees so-called the new union appeared unexpectedly, and its beginning was price competition. Currently, competitors from Central and Eastern European countries are not cheaper competitors at all – the services they offer are of higher quality. As is known, the initiator of changes in the regulations on the posting was France – the Commissioner indicated that even before the election, the current President Emmanuel Macron as the Minister of Economy, presented free market and joint market attitude during the talks. Currently, this attitude is still presented in official speeches, but in practice it does not coincide with the position of France regarding individual economic solutions. A change in attitude may be the result of the transformation of social tendencies. The postulate of reflecting on what Europe we want and the skillful building of a coalition in the EU with countries whose interests coincide with the Polish ones is coming back. 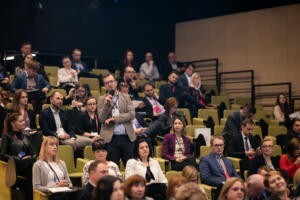 One of the participants drew attention to the speech of the ELMC speakers, who indicated that Poland had a chance to develop in the field of services and should now agree to compromise solutions. According to the commissioner, from the perspective of the common market, the principles being violated are broken by directives and EU legislation. In addition, not only Poland and our part of Europe benefits from EU concessions and funds, but also countries such as Portugal and Italy. Until we reach the stage of achieving a similar standard of living in all countries by developing a common market, such protectionist actions are violations of treaty rules. It is unpredictable what the outcome of the European Parliament elections will be – pro-European or anti-European. If the second option prevails, protectionist regulations will prevail and this will lead to the erosion of the Single Market. What can be done to maintain the free flow of services? Further questions focused on possiblity of specific actions aimed at protecting the Single Market. What can service industry companies from Poland do to show that Polish service companies are not only competing with price but high quality so that their voice is heard? In response, among others proposal for the organization of a joint campaign promoting the quality of cross-border services in the EU. In addition, it is claimed that the balance between the Treaty freedom to provide services and the protection of employees’ rights is affected and that it requires a reformulation in the context of the protection of workers. What could the protection of workers consist of without violating the freedom to provide services? In the opinion of the Commissioner, it would be necessary to re-open the directive and reformulate it. However, this is unlikely. In her opinion, the balance was shifted towards social protection at the expense of the rights of the internal market. As for Poland, it is now necessary to build coalitions and alliances with strong states. There is also a need for political will on the part of the leaders of states, which is difficult to see at the moment. Citizens’ Dialogue was a meeting with the public mostly familiar with the subject of posting employees and the freedom to provide services. However, it was possible to present this phenomenon in the broader context of the functioning of the common market and the trends and directions of changes in EU law regulating the Community economy. A very uncertain picture emerges from this discussion – it is impossible to predict in which direction Europe will go, and will the Commission’s actions in the coming years, under the influence of individual Member States, aim at the consolidation and consolidation of the EU internal market recommended by the Commissioner, or rather to its erosion and departure from community values? Undoubtedly, it depends to a large extent on the citizens themselves and what signals they will give to their representatives in the EU government and institutions. The moderator of the discussion was Maciej Zakrocki (TOK FM). 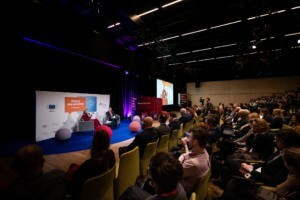 The Civic Dialogue took place as part of the 2nd Day of the 6th ELMC in Krakow. •LMI analysis regarding compliance of the provisions of the amended Directive on the posting of workers with the TFEU, in particular its Article 56. We invite you to see photo gallery from ELMC.